I have been buying a lot of single – size frozen pizzas lately. My teenagers love them. I finally decided to try making my own version. Using this recipe, you can make 8 small pizzas that are 7″ in size. These can be frozen and quickly heated later on a busy night. Or you can have them available for the children at any time. 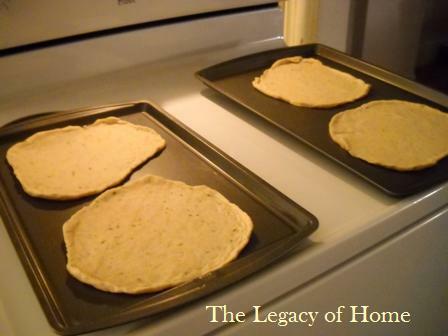 I use an easy, no-yeast pizza dough recipe I made up years ago, when we didn’t have any yeast in the house. It has seasonings to help create a nice flavor. The dough is quick and easy to work with. No need to let it rest or rise. After you have your dough ready and divided, the pizza crusts will be ready to pre-cook. In the photograph below, you will see 4 of the 8 pizzas, ready for sauce and toppings. Mix together 2 cups flour, salt, sugar, oregano, basil, garlic powder, and onion powder. Pour in the warm water, add the olive oil. Mix well. Add another cup of flour. Stir until well mixed..
Place dough on a floured (and lightly oiled) counter and knead until smooth, using the rest of the flour as needed. Shape dough into a ball, then cut into 8 equal pieces. Roll out one of the doughs into a 7″ inch circle. Place on a cookie sheet. Repeat until you have filled your cookie sheets (2 should fit on each one). Pre-bake crusts in a preheated 450 degree oven for 2 minutes. Remove from the oven and allow them to cool, while still on the pans, for 5 minutes. They are now ready for sauce and cheese. Each pizza will use 1/4 of an 8 oz. bag of cheese. Once these are ready, place them in the freezer. You can wrap each one in wax paper, and store inside a large ziploc freezer bag. When you are ready to bake frozen pizzas, cook for 13 minutes in a pre-heated, 450 degree oven. I put my pizza crust in a pie pan for the perfect pizza for one size!I do pre cook a few minutes(less than 5 minutes) Freeze them in the pan, then pop them out and put them in an ice cream bucket. Does anyone ever try to put meat on their pizzas or any other toppings? I’m trying to figure out what else I can put on these. Any input would be appreciated. My family loves pizza & this would be great to make!!! Thanks for sharing this!!! I prebake and freeze pizza crusts in various sizes (think Boboli but home made and frozen instead of store bought and preserved). Then I just pull out, top and bake. Makes home made pizza faster than delivery! 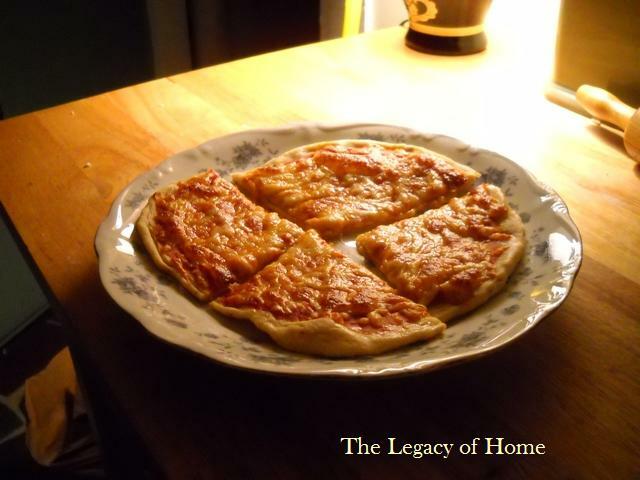 Home made Pizza is an AWESOME way to “remake” leftovers! Yesterdays taco leftovers can be tomorrow’s Taco Pizza! The leftover sauce and meat from the spaghetti dinner is the start of a “traditional” pizza…. And then there’s breakfast pizza– cheese sauce or white gravy, scrambled eggs, bacon, sausage or ham and cheese…. I think there’s a rule somewhere that if it has a crust under it, cheese over it and call it pizza they have to eat it….. Question? – All-purpose flour or self-rising flour? Kathy, I use all-purpose flour. Hey this is great information. My wife and I are doing the Daniel fast the next few weeks and could really this to make some pizza crust. I’m going through withdrawal. What leavening do you use in the crust?